Today's sophisticated technology means it takes only a few minutes to go online and buy a car, check out a library book and ... lease an apartment? Yes, it's true! There are a growing number of software programs that allow landlords and management companies to offer digital leases. Our Springs leasing team answers some of the five biggest questions you might have about this process that's becoming increasingly popular. 1. 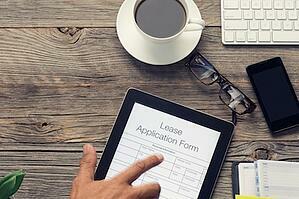 What Is a Digital Lease? A digital lease differs from a paper lease in format only. Software companies enlist assistance from lawyers who specialize in rentals and leasing to craft contract templates that are compliant with the various state regulations. Landlords and management companies can then add their own specific terms and clauses. Keep in mind that an email agreement does not constitute a digital lease. Simply exchanging emails to accept an apartment puts you on murky legal ground and doesn't protect your interests. 2. How Is a Digital Lease Completed? Everything is conveniently handled online. Once the lease is ready for review, you receive an email with a link along with instructions for signing. Afterward, the lease is stored in a portal that's accessible only by you and the landlord or management company. 3. Are Digital Leases Legally Binding? Digital leases have the same legal status as printed leases. In 2000 Congress passed the Electronic Signatures in Global and National Commerce Act (ESIGN), making electronic signatures as legally valid as handwritten ones. 4. Are Digital Leases Secure? As more and more business transactions are being completed online, digital security has become stronger to assure the safety of sensitive personal information. Digital lease software uses AES encryption protocols which are also used by the military, government agencies and financial institutions. 5. What Are the Benefits of Digital Leases? You don't have to make a special trip to sign a lease in person, even if you live out-of-state. While it's important to fully understand all parts of a lease, you may feel uncomfortable taking time to read it carefully when you're on the premises. With a digital lease you can read it at your leisure and even have a lawyer review it if you so choose. No longer will you tear your hair out trying to remember where you filed your copy of the lease. Your digital lease is safely stored online so you can refer to it or print out a copy whenever needed. Digital leases are eco-friendly, conserving resources by reducing paper usage. Did you know that you can also pay your rent online? The friendly members of our Springs on-site management team are ready to help you navigate the leasing process from start to finish!